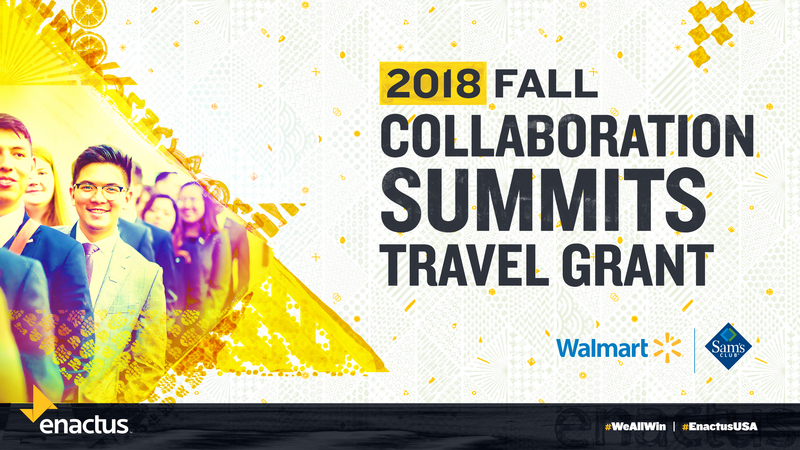 Walmart and Sam’s Club are sponsoring travel grants for up to 18 teams to attend one of the Enactus USA Fall Collaboration Summits. The grants are available for teams located 100+ miles from the closest event and will be offered in the form of a reimbursed of approved travel expense. The Fall Collaboration Summits are an opportunity for new students/teams to receive and introduction to Enactus, learn the basics, and network with other teams, as well as for more developed/returning teams and students to dive deeper into concepts surround team sustainability, resources sharing and availability, project management, and competition. These events are geared toward training, networking, career development, and collaboration. Teams attending the summits will be encouraged to network with other teams and partners, build their professional knowledge and experience, and share their ideas. We are excited to be able to offer this opportunity to Enactus USA teams this year and thank Walmart and Sam’s Club for their continued support of our organization and initiatives to build engagement. Must be located a minimum of 100 miles from the nearest event. Must be able to demonstrate the need for financial assistance to travel to the Fall Collaboration Summits. Must be able to send a minimum of four (4) attendees to the event, including one (1) faculty advisor. Each advisor and student planning to attend must have a registered account through Enactus USA. To create an Enactus student or advisor account click here. Each attendee must be registered to attend one of the two 2018 Enactus USA Fall Collaboration Summits. To register as an attendee, click here. Each student planning to attend must upload a copy of his or her resume on page one (1) of the Enactus USA Fall Collaboration Summit student registration (link above). Teams must be present for the entire event, from 8:00 AM to 4:00 PM on the day of each event.